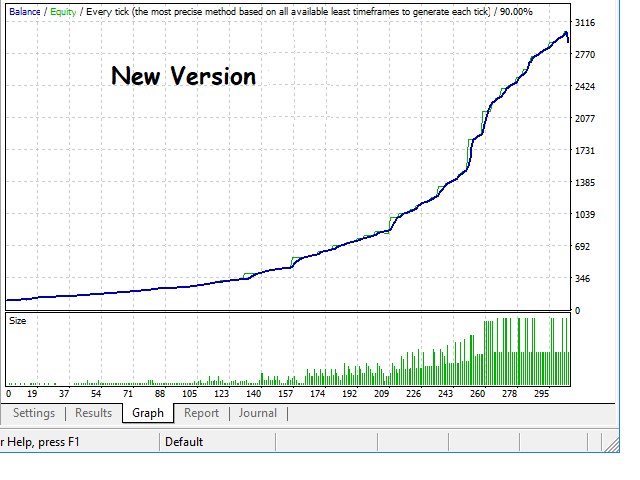 The Lite Hamster Scalper is a Trading Robot with no use of Classic martingale. Schedule scalping Options. it uses some Indicators as a filter to maximize Correct entries. Maybe it was my set up, but I have had this free version running for a couple months now and two times it didn't take profit and and carried out to the SL. Two big loses for my account. I wouldn't dare at this point to use this free version again. I made little profit in between those loses, but the loses wiped it all out and more. Maybe there are other reasons for it, such as slipping, even though I had it set to the default settings. Not sure why. Great results, it's like a stubborn mule it holds til in profit patiently unlike I can do as a human can't watch screen for hours and I question myself and change my strategy up after losing, THIS doesn't have human flaws like greed or weariness etc, very few losses, big drawdown happens when you try other pairs but also happens on eu too.. I am running this on 9 pairs simulataneously on tw demo with $10k bal starting, seems to grow by 50% in 8 hours before taking big losses from margin or sl hit, so it's a robust system no doubt, and I think it could work really well with some thoughtful tweaking to lotsize per 100 to control risk. It's likelihood of winning is very probable given time, manual intervention could definitely be helpful but not often at all, mostly just figure out your risk profile by doing .01 per 100 to start and tweak it.. I have created a reliable signal based on my powerful set files. Very similar to Ramil Hamster. Good EA! I came from your YouTube Channel, Thank you! Good robot, thank you for make it for free, I will use the hamster pro soon. Плохой советник. Настройки по-умолчанию. В первый же день убыток больше половины депозита. Открыто 8 сделок на продажу, все закрыты в убыток. Not bad, the percentage of accurate inputs is large. By proper setting and MM, Hamster is greatest EA. This Hamster EA is the best, Only Profits till now. work great! make want to buy the pro version! So far, so good. Early days still, but looks good. Very impressive results, brilliant strategy! The living proof that you do not need sophisticated indicators or complicated strategies to make a profitable EA. Thanks for posting this version for free. For all the people with bad reviews, the only problem is you, the strategy is solid. Just use a 20-100 level and start from there. great EA, I recommend it.It works really well, an excellent 10-star work. In one week 100% profit even better than Hamster Scalper because today has not made any entrie and Lite Hamster Scaslper 5 buy entries with profit with the same broker Fbs account ECN, you have to give opportunities and see what you do when the market goes against. many popup stress to me but , l soon get results..
Great EA, Very easy to setup. Exact same actions as Hamster Scalping EA. This seems to be a good EA. I reduced SL to 1000 and the max number of trades to 6 and this appears to work well. Great low risk EA but crazy Risk/Reward ratio. 12 months backtests are good but 3-5 years backtests are not so good. Himma, the forward test on demo account works great. The only thing that could make this even better if you could close all open trades with FIFO (First In First Out) compliance. I tested on Oanda broker and it complained about FIFO violation. I believe it's doable since all of those open positions close at the same price. Thanks, and it's a great EA!! Mira, otro trozo de carne para echarle al arroz. Yo creo que este ratón le ha estado oliendo los huevos al otro, pero da igual, ninguno de los dos funcionan bien. 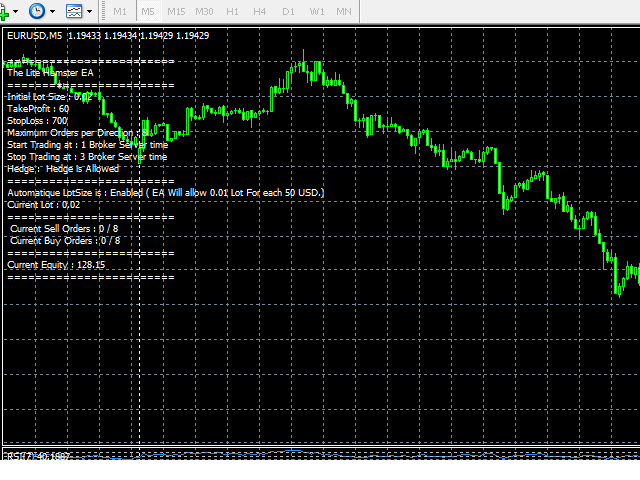 Very nice one and I tasted SL 60pips TP 3pips also SL60 TP 6 are good, but default setting is good as well but if I get SL, it huge loss.... not very often but. Anyway Many thanks to make nice EA. very nice ea, all trade profits so far. absolutely powerful ea. Closing Orders using FIFO Added. Maximum Lot size Per Trade (input added). Free version is no longer available. Editing a text Message, The EA is Totally For Free! Adding aa Alert message to users at the launch of App.